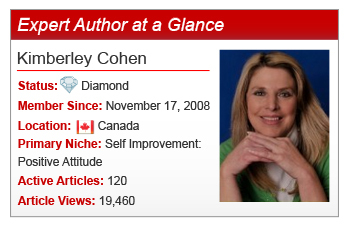 Founder, facilitator, and personal insight coach, Expert Author Kimberley Cohen is a positive attitude and happiness master. Certified in Body-Mind Counseling, Process-Oriented Body Work, and Spiritual Psychotherapy, Kimberley assists others by helping them minimize the stress and anxiety of day-to-day living. A pioneer in her niche, Kimberley developed the Insight Technique, which helps others minimize the stress and anxiety in their lives. Providing clarity and illumination, Kimberley drives readers to question and understand their thinking in order to transform what blocks and limits them from maximizing their overall happiness and potential in life. Check out more highlights from our interview with Kimberley below! What are 3 article writing challenges you’ve faced? Giving up my agenda, trusting where my inspiration is coming from, and what I am going to write about. Writing from my personal experiences and my heart, as opposed to just writing for the sake of writing (quality vs. quantity). Letting go of trying to please everyone, sticking to what I know and do best, and trusting that others may help. What EzineArticles tools do you find the most beneficial? Your newsletters and the article performance summary. I believe it helps when we share our personal journey because we never know whom it may touch and/or inspire … Write about what you know. Write from your experiences and your heart. Keep writing. Thank you for being a great source for publishing articles and for your helpful writing tips. Empower yourself as an Expert Author by retuning your own insight to maximize your great potential. Take Kimberley’s advice: write what you know by writing from the heart. Do you have a question or comment for Kimberley? Feel free to leave it in the comments section below. On My.EzineArticles.com? Add Kimberley to your Network! Hi Kimberley, congrats on the publicity! You obviously have a great insight on how to create quality articles all while maintaining your credibility in your niche. Good job and once again, congrats! Thank you for your comment! One day soon I will turn my insights and articles into a book. Wishing you continued happiness and success. Wow! I am speechless of her simplicity and down-to-earth approach in life. Interestingly, I like the same things that motivates here. Mine is, however, more inclined towards the sea which I have a very strong sentimental connection with. The sea, ocean, beach, sunset or sunrise, thunderstorm, gentle rain, snow fall, birds singing, animals, and the list goes on and on. May the sea continue to motivate and inspire you. Congrats Kimberley on the publicity!